Wastewater treatment involves more than just producing an effluent that is protective of human health and the environment. Increasingly, municipalities and others concerned with wastewater treatment are recognizing the potential that exists for extracting and reusing elements such as phosphorus, energy and water, from wastewater, transitioning from traditional wastewater treatment models to water resource recovery centers. This article looks at the role of conveyors in phosphorus recovery from wastewater. Phosphorus is essential to all life and an important element for human nutrition. It plays multiple roles as a building block in the human body and, as a fertilizer, is an essential nutrient for healthy crop growth. Without phosphorus, the basic cells of plants and animals, and even life itself, would not exist. Traditionally, the global phosphorus supply is mined from a finite source of phosphate-containing minerals. As the world’s population grows, the demand for phosphorus continues to rise. However, as a limited and non-renewable resource, once consumed, phosphorus is difficult to reclaim. Once phosphorus enters the human body as food, it is discharged back into the environment through wastewater. In addition to the phosphorus discharged annually by human waste, surface water can carry large amounts of phosphorus-laden runoff from fertilizer used on gardens, fields, and lawns. Unless the phosphorus is recovered from wastewater during treatment, the net result is that phosphorus-rich effluent is discharged back into the environment. Unfortunately, effluent containing excess phosphorus can be harmful to the environment. Phosphorus discharged in lakes and streams can cause toxic algae blooms, disrupting the ecosystem and threatening water supply. In addition, phosphorus that is discharged in effluent is lost, contributing to the global depletion of this valuable resource. Due to these factors, regulators and wastewater treatment facilities are now moving aggressively to implement limits and methods for removing, recovering, and reusing phosphorus that would normally be discharged in effluent. One approach to recovering phosphorus from wastewater is through the use of chemical precipitation. However, this approach is expensive and results in the production of excess sludge which requires further processing. Fortunately, Vancouver-based Ostara Nutrient Recovery Technologies Inc. has a different solution. Ostara is a leading provider of a proprietary technology designed to assist cities and municipalities in managing excess nutrients through recovery, converting the nutrients into a Root-Activated fertilizer, sold as Crystal Green. Ostara’s process for phosphorus recovery is based on a closed-loop solution where, instead of viewing wastewater streams as waste, Ostara sees a renewable resource that can generate revenue for treatment plants, while helping meet environmental regulations. When wastewater treatment plants remove phosphorus from the wastewater, it concentrates in the solid residues produced. The nutrients are often recycled back into the wastewater when the solid residues are processed through anaerobic digesters, creating a new problem of nutrient-rich scale called struvite. The struvite not only clogs pipes and valves, reducing flow, but requires costly maintenance and results in excess production of biosolids. By controlling the crystallization of struvite in a fluidized bed reactor, Ostara’s Pearl technology recovers struvite (magnesium ammonium phosphate) in the form of highly pure crystalline pellets or “prills.” Nutrient-rich feed streams are mixed with magnesium chloride and, if necessary, sodium hydroxide and then fed into the Pearl reactor where minute particles or struvite “seeds” begin to form. Like a pearl, these seeds grow in diameter until they reach the desired size – 0.9 to 4 mm – which is controlled by varying key parameters. In a municipal wastewater treatment plant, up to 85 percent of the phosphorus and 40 percent of the ammonia load is removed from sludge dewatering liquid using this process and the resulting product is marketed as Crystal Green. With Ostara’s technology, wastewater treatment facilities can recover phosphorus for reuse as an eco-friendly fertilizer, saving on chemical costs, reducing biosolids production, and creating a new revenue stream for the municipality. Here is a brief overview of the Ostara process for recovering wastewater phosphorous and the key processing equipment employed. 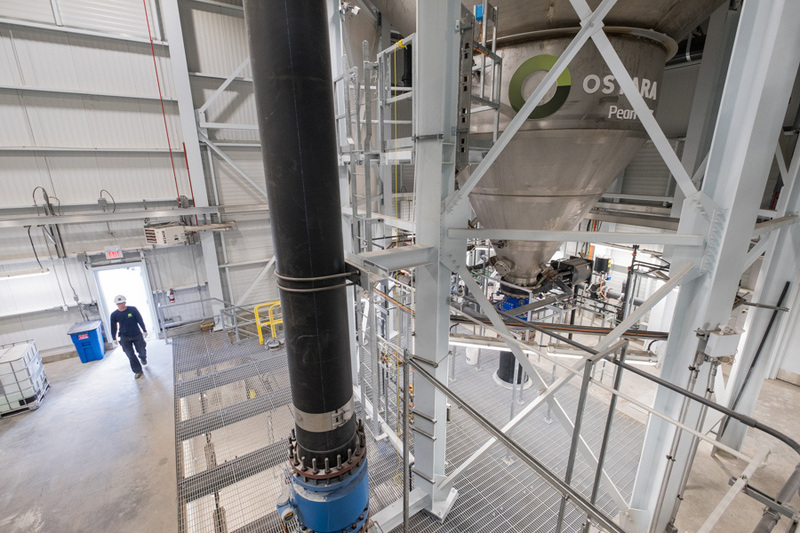 First, Ostara’s Pearl 2000 fluidized bed reactor creates crystalline struvite pellets (prills) that are harvested from the reactor in the form of a slurry consisting of approximately 10 percent solids by weight. The slurry enters a Kason Vibroscreen single-deck circular vibratory dewatering screener equipped with a 35 mesh (445 mm) screen, that causes liquid and particles smaller than 35 mesh to pass through the screen, and prills 35 mesh (445 mm) and larger to vibrate across the screen as they are dewatered to a moisture content of 18 to 20 percent before exiting through a discharge spout at the periphery of the screen. The screened and dewatered prills then pass on to the horizontal fluid bed dryer, which further reduces the moisture content to 0.5 percent. By using a combination of heat, air flow, and vibration, the dryer separates and fluidizes the individual particles to maximize drying. Once dried, the prills are conveyed via a TipTrak bucket conveyor to a Kason four-deck circular vibratory classifier that separates the prills into five fractions ranging from 3.5 to 1 mm. The classifier consists of a top deck with a 6 mesh screen. Each deck below has a screen with progressively smaller apertures – 8 mesh, 14 mesh, and 18 mesh, respectively. Prills smaller than 18 mesh exit the classifier’s bottom discharge spout. Finally, the classified prills are fed into a Contemar indoor flexible fabric silo. The storage silo consists of four compartments, one for each size of classified prill. The silo is constructed from uncoated flexible fabric that is impermeable to powder and microorganisms, while remaining permeable to air. This feature eliminates the development of condensation and moisture within the silo. The flexible nature of the Contemar fabric silo improves product flow and reduces the risk of product bridging as it transfers into the bag filler. Hence, no special discharge aids are required. Ostara needed a bulk bag filling system to fill bulk bags from the Contemar silos for shipment. After a careful examination of potential suppliers they selected Spiroflow for its C2-2R bulk bag filler to install directly below the Contemar silo. The Spiroflow C2-2R bulk bag filler was provided with a slide gate fill control valve, automatic height adjustment to accommodate bulk bags 30-70 in. tall, a weigh platform with NTEP certified load cells and weigh controller for gain-in-weight bulk bag filling, vibration for product compaction to provide safe and stable filled bulk bags, automatic bag loop release, an automated roller conveyor, and a gravity roller conveyor. An operator installs an empty bulk bag by attaching the bag loops onto the bag hooks and placing the bag filling spout over the inflatable neck seal. From the control panel the neck seal is inflated to firmly secure the bag spout and the desired fertilizer prills are loaded from the silo above utilizing the slide gate fill control valve. The weigh controller fills the bulk bag to the programmed 1 ton weight by utilizing ‘fast fill’ then transitioning to ‘dribble feed’ for the highest weighing accuracies. The inflatable neck seal then deflates, the bag loops pneumatically release, and the operator ties off the bag spout before the automated roller conveyor advances the filled bulk bag to the gravity roller conveyors for removal by forklift. A key aspect of Ostara’s technology is gently and safely handling the fertilizer (struvite) prills as they move through the process. Because the struvite prills are somewhat friable and must retain their size and shape to work effectively as a slow-release fertilizer, product degradation is a key concern in handling. Another key concern in product handling is spillage: Because wastewater treatment facilities are often minimally staffed, regular cleanup of spilled product would increase the operational costs. To address these challenges, Ostara selected a TipTrak TT500 bucket conveyor manufactured by UniTrak Corporation Ltd. This conveyor’s interlocking bucket design, where each bucket is connected to its neighbor via a rubber joint strip, ensures gentle product handling and minimizes spillage from infeed to discharge. The small footprint of the conveyor also met Ostara’s process needs: With a minimum lower horizontal length of less than five feet, the conveyor was easy to integrate into confined spaces within facility layouts. • Extended legs on the lower horizontal sections – this minimizes the fall of product from the dryer, reducing product dusting. “UniTrak’s ability to provide a customized, easy-to-install and maintain solution has made the material handling aspect of the process much simpler, and Ostara have now standardized on the TipTrak equipment at all of its sites in North American and Europe,” said Ahren Britton, Ostara chief technology officer. With more than 10 municipalities in North America adopting the Ostara system, and several more installations on the horizon, Ostara is an excellent example of how a company can successfully integrate various types of equipment made by different manufacturers within its operations.